Vaccine conspiracies have been a growing controversy lately and leads to many discussions and arguments between parents and different professionals of the medical field. The controversy over "clean" vaccines and the relationship between vaccines and autism has been a prevalent issue over the past years. Autism is a very serious developmental disorder that some children have to suffer through and learn to live with. They are emotionally detached and usually have limited ability to communicate with others. There are some conspiracies that go along with autism but the main conspiracy has to do with some vaccines being the cause of autism in some children. The controversy over vaccines have been a point on interest for many new parents. Different public figures such as Jenny McCarthy, David Icke, and Dr. Wakefield have all talked about the affect vaccines have on a child. The CDC and FDA all have reports saying there is no real connection to vaccines and different illnesses. There are many cases in which the parent has come out and spoken against having their child vaccinated because of injuries their child acquired after having their vaccinations. Jenny McCarthy is a popular advocate for "clean" vaccines after her son was diagnosed with autism, that she believes was triggered by his MMR vaccines. In the video below Jenny talks about her beliefs and opinions with vaccines. She also talks about the struggles she goes through on a daily basis with her young son with autism. She is criticized in the public eye for her beliefs and the work she does vaccine prevention. Jenny McCarthy has talked on many news programs, and different tv shows. She has also written books about her life, one specifically called Louder Than Words. Louder Than Words talks about McCarthy's every day struggles with raising a child with autism, how she is curing her son, and how it was his vaccinations that she claims triggered his autism. There are other people, websites, and books that agree with the research about how vaccines cause different injuries. Not just in the United States. All over the world there are stories about vaccine conspiracies. In Australia there is a women named Meryl Dorey who believes in anti-vaccines and supports David Icke's work that the vaccines being more dangerous than the actual flu. According to David Icke the swine flu vaccine in particular was created in a lab to create panic all throughout the world. People all over the world feed into the work that people, such as David Icke, fight for what they believe in. All of the medical facts are never considered with these people. The main argument that the public, especially parents, have about vaccines is that they are not clean and that they are the cause of many injuries that occur around the same time that the vaccine was given. There are many parents that give touching testimonies about their own struggles with children who have "vaccine infected injuries". Some of the stories are so emotional that they convince others to not vaccinate their own children. It is dangerous that so many people fall into the emotions of other parents and change their own opinions. People are convinced by fear, and not by reason, to decide whether to vaccinate their children or not. Fourteen years ago, Dr. Wakefield came out with a report talking about the link between vaccines and autism. Wakefield is one of the most controversial figures in the autism world. His research showed a direct correlation between the MMR vaccine and autism. Because of Wakefield's report, millions of dollars have been fundraised to warn parents of the "dangerous" affects vaccines have. His research was tested for many years and no real evidence was found to show a relation between the vaccines and autism that Dr. Wakefield reported on. Dr. Wakefield's report was later declared as fraudulent and he no longer is a practicing surgeon or medical researcher. He was supposed to gain a large sum of money from his report until he was later found fraudulent and stripped of all of his titles. Dr. Wakefield's report caused many disputes with parents and members of the medical field. There are still many people who believe in Wakefield's work today and support him continuously. Thimerosal is the antiseptic that some parents worry that it is used in different vaccines, more specifically in the MMR vaccine. That is not true today in most vaccines. Studies to this day have not found any link between vaccines that have thimerosal in them and vaccines that do not, and autism. 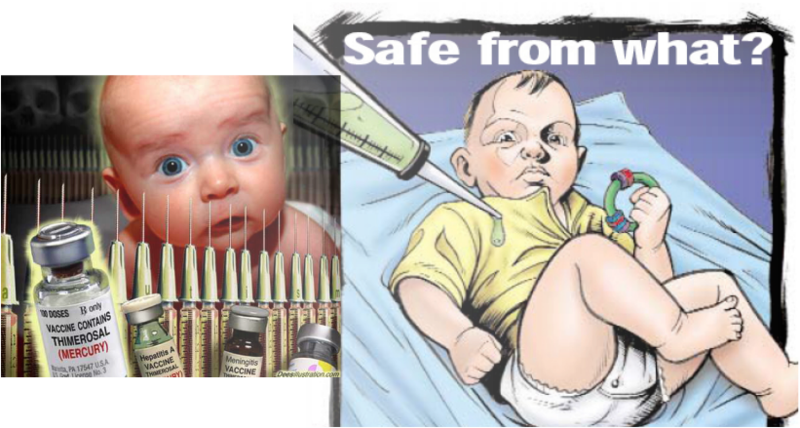 Thimerosal is used in some immune system related vaccines but only in small, safe doses. Thimerosal is a mercury containing preservative. Thimerosal is used in some vaccines and other drugs. It has been used since the 1930s. Today Thimerosal is not found in any pediatric vaccines, only trace amounts. No harmful effects from the use of Thimerosal in vaccines have been noted besides some redness or swelling around the injection site of vaccines. Thimerosal has not been found to have any links with autism. Parents also worry about the MMR vaccine because it is a vaccine that combines three different vaccinations into one injection. They worry that the amount of vaccines in one injection can cause injuries to their child. Specifically the MMR vaccine that has three vaccinations in one injection. There has been no link to vaccines with multiple vaccinations and autism as well as the claims of the use of thimerosal. Parents associate autism with vaccines because autism starts to show in children around the same time they receive certain vaccinations. Vaccines save lives, they are very important to young children growing up healthy. Vaccines can prevent some very serious diseases. The Center for Disease Control continues to advocate the importance of vaccines. Today vaccines are safer than they ever have been because they have to go through a series of tests for years before they become licensed.